Whether your kitchen is outdated and in need of a refresh, or you're designing a kitchen from scratch thanks to a new kitchen extension, knowing how to design a kitchen well is vital to your success. And by 'design', we don't just mean concentrating on your kitchen's looks or cabinetry style. Planning your kitchen storage options and practicalities such as lighting and flooring are essential, too. Looking for more kitchen advice? 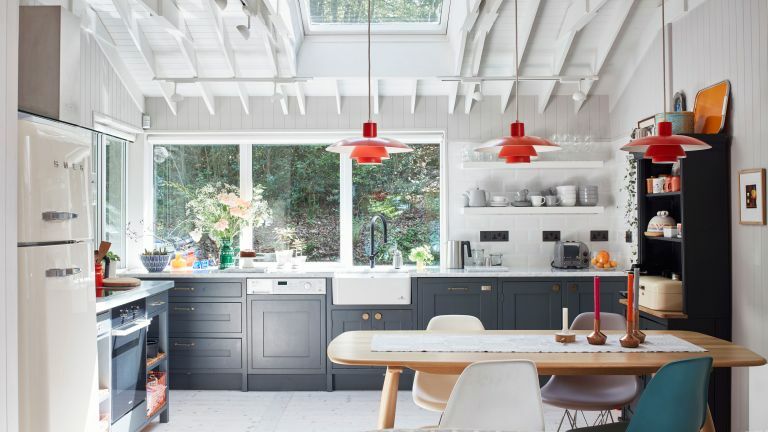 Use our ultimate guide to planning, designing and furnishing a kitchen for advice and inspiration – and find out how to design a kitchen extension to plan for success, too. Kitchens used to be hidden-away work spaces, but today they’re rooms in which we spend huge amounts of time. Not only do they need to offer the preparation and cooking facilities that suit all the home’s occupants, but they must also be stylish space we want to enjoy being in. Often, they’re a zone in an open-plan kitchen diner and living space, so the kitchen’s decor must work harmoniously with dining and relaxing areas as well. Planning ahead is key if you wish to successfully design a kitchen that fulfils all your expectations, and our guide will get you there, whether you’re going it alone or have called in the help of an expert. We know choosing a kitchen designer, architect or builder is a big part of the process, which is why we've put together specialist guides aiming to help you choose the best professional for your project. When you design a kitchen, it’s important to understand the space you’re working with. Ask a kitchen company, an architect or architectural technologist – or use graph paper – to carefully make scale drawings of your kitchen's floorplan. Mark the location of internal and external doors and windows, so you have the best flow possible between your kitchen, outside space and the rest of your house. You'll need to factor zones into your plan if you're designing an open plan kitchen, too – our specialist guide can help with that. Once you see exactly how much room you have to work with, you can start planning how to make the most of it. It will also give you a clear idea of how much you want to spend before beginning the design process proper, ensuring you end up with a scheme you can afford – and helping you reduce excess costs early in the process if your plans don't match your budget. Explore our handy tips if you're looking for ways to cut the cost of your new kitchen. We have plenty of guidance for planning a small kitchen or creating a family kitchen too, if you want tips on creating a successfully cohesive, well-laid out room. The kitchen layout should be designed to perfectly fit your lifestyle. Focus on the layout of the working part of the kitchen, as well as on its relationship with a dining table, if there is one, or – in an open plan kitchen-living-diner – the other zones. To plan the preparation and cooking space, use the design concept of the working triangle of the kitchen. The three points are the fridge, sink and hob with imaginary lines between these forming the triangle shape. The three points should be near enough to each other to make meal preparation efficient but each work station should be uncramped. This may consist of a single run of units along one wall, or a double galley, which has a second run directly opposite. In an open-plan space, the facing cabinetry may take the form of an island, leaving the run of units on an exterior wall. A galley is an efficient working arrangement. In a double galley, putting the sink opposite the hob makes for a sensible design. Plan in worktop space either side of the hob. Beware of hanging too many wall units, which can make the space feel narrower. Open shelves or glass-fronted units may be better alternatives. See our galley kitchen design ideas for inspiration. Here, the units are positioned around three walls to make a U shape. It’s simple to form the working triangle with one each of the hob, sink and fridge on each of the unit runs. A U-shape is especially valuable if you want plenty of worksurface and don’t have the space for an island. However, in a larger kitchen you could add in an island at the U’s centre as well. Consider, too, using the shape in an open-plan room with the third run of units creating a peninsula between kitchen and dining space. Browse our U-shaped kitchen design ideas for advice and tips. In these layouts, units occupy two walls. The working triangle can be formed with, for example, a sink on one wall (especially if this is where the window is), and hob and fridge on the other. Ensure you leave preparation space either side of the hob in an L-shaped kitchen, whichever section of the L it’s on. Don’t overload an L-shaped kitchen with wall units. Try limiting them to the longer part of the L. A bank of tall units on the short part of the L, meanwhile, can be space-efficient, if there’s not a window positioned there. See our L-shaped kitchen design ideas to get you started. If you like the idea of incorporating a kitchen into an open plan layout, it usually makes sense to have the kitchen in the darkest part of the space, with the dining and living areas – where you will spend more time relaxing – closest to windows overlooking the garden. There’s a growing trend for ‘broken-plan’ living, where the spaces are only partly separated – you may want to include a half wall between the kitchen and living space, or a pocket sliding door that allows you to divide off the dining room for more formal entertaining. A key component of most kitchens these days, take time to consider the best location for your breakfast bar or kitchen island. You can ask your designer for advice. You don’t want it to interrupt the flow of the room, and may want to integrate your sink or hob into the island to allow the chef to interact with people using the rest of the space. Browse our clever kitchen island design ideas for practical advice, as well as design inspiration. We have plenty of kitchen island seating ideas, too. Your choice of glazing should be carefully considered if you intend to design a kitchen with an open-plan layout, or as part of a new kitchen extension. Though desirable from a design perspective, bi-fold or sliding doors across the back of the room will limit the wall space available for kitchen units here. A door with less width, plus a window, will leave you with an under-window area for kitchen cabinets. Designing a kitchen: which style? With the layout planned, it’s time to consider the look of your kitchen. Overall, the choice is between cabinetry with a contemporary look, and more classic designs. Modern in appearance, these kitchen units can be handless, have recessed handles, or complement cabinets with a modern finishing touch like bar handles. If you like the idea of a modern kitchen, you'll find plenty of inspiration in our contemporary kitchen design ideas. Based on a simple frame around a centre panel, shaker style cabinets have certainly stood the test of time, and if you opt for wood, are easy to update in future, too. Browse our stylish Shaker kitchen design ideas for inspiration. With details such as cornices and pelmets, traditional Georgian and Victorian panelled cabinet doors make a grand effect.They can suit period rooms with high ceilings, as well as kitchen extensions to Victorian homes. See our guide to creating Georgian and Victorian style kitchens for more advice and inspiration. The easiest way to give kitchen cabinets a country cottage feel is with a lick of paint – we love the idea of cream, grey, green or other muted shades. This not only gives a space that much-desired homely feel, but can brighten up a dark space. Browse our traditional country kitchen design ideas for more inspiration. Don’t forget that kitchens don’t have to be composed of fitted units. A freestanding kitchen with its individual furniture pieces can complement a period home, or make a focal point in an open-plan room, and can be taken with you if you move home. Explore more flexible freestanding kitchen ideas. The materials from which both unit doors and carcasses are made will affect how much you pay for your kitchen. At the budget end of the market, cabinet interiors will be made from materials such as MDF, while high-end kitchens may have carcasses made using wood. At the budget end of the spectrum, this may be vinyl-wrapped, lacquered or made from or faced with acrylics. Prefer matt finishes? Vinyl-wrapped and lacquered matt doors are also on offer. Browse our ultra-modern kitchen design ideas for an idea of what can be achieved. These are available in a large range of timbers, which can be painted if you prefer a natural materials but a coloured finish. Veneered doors are perfect if you're looking to make a statement with gorgeous grain patterns and colour tones on show. You’ll have to live with the design for years, so it’s worth spending time getting it right. Browse our kitchen case studies and cabinet design ideas to pull together a mood board of what you like. Allow yourself some time to do this and you’ll soon see key themes emerging. Kitchen worktops need to work with your budget as well as tastes. Laminate, at the budget end of the market, can take on the appearance of other materials and is easy to look after. Opt for the best quality you can. Wood looks warm and is pleasing to touch, but does need regular care. Natural stone can look spectacular and each piece has a unique appearance. It should be sealed. Man-made composites are hard-wearing and easy to look after. Don’t rule out more unusual materials, though. Stainless steel will create a professional look; concrete and concrete-look quartz can look beautiful and coloured as well as the expected shade; and glass is eye-catching as a work-surface. If you're not sure which kitchen worktop will work best with your new space, our guide to the best kitchen worktops talks you through the options in depth, providing practical advice and design inspiration. Positioned behind the sink, the hob and anywhere else that risks getting damaged by water or cooking, kitchen splashbacks can repeat the worktop material as an upstand or larger area, or be created with a contrasting material. Don’t just think tiles. Glass, mirror, stainless steel and timber are all possibilities to give your kitchen the look you want. You'll find plenty of inspiration over in our kitchen splashback ideas guide. Remember than opting between freestanding and built-in appliances will change the look of your kitchen. An American-style fridge-freezer can make a great focal point. Even if you’re not sizing up, retro-look fridge-freezers or colourful finishes create impact. Built in appliances, warming drawers and coffee machines banked together in tall units look smart. A range cooker makes for an appealing feature in both more traditional and contemporary kitchens. Fully integrated appliances will leave cabinetry to the fore and can suit period homes better. Once you're at the stage of planning where to position appliances, you'll want to think about where you intend on putting the kitchen sink, too. This may be determined by a desire to look out of the window while washing the dishes (as is traditional) or a preference for looking onto the rest of the kitchen – in which case fitting a sink within a kitchen island might be more appropriate. We've written a specialist guide to make sure you buy the best kitchen sink. There are guides for the best kitchen faucets and the best boiling water and hot water taps, too. Factor kitchen lighting in early if you're determined to successfully design a kitchen. Ambient, task and accent lighting should all have their place in a kitchen lighting scheme whether it’s in a separate room or part of an open-plan area. Ambient light for a kitchen needs to be good enough for working with sharp knives and hot dishes. Ceiling spotlights can be supplemented with wall lights. Task lighting should illuminate work surfaces, cooker and sink area. It includes under-unit lights and directional ceiling spotlights. Accent lighting can include pendants for islands or a dining table, and LEDs beneath units that make them appear to float. Consider, too, lighting cabinet interiors to show off beautiful tableware placed on glass shelves. Make sure you plan in separate lighting circuits to operate the different types of light individually. Find out how to plan kitchen lighting, and check out these kitchen lighting ideas. If you’re planning a kitchen extension, take the opportunity to introduce daylight from as many directions as possible – including rooflights and high-level or obscure glazed windows where privacy may be an issue.Prioritise the best quality space – with the best daylight and nicest views – to the functions that are most important to you, usually living and dining. Looking for tips on how to choose roof lights? Our guide covers everything you need to know. We've got tips on how to create space and light with glazing, too. Shutters work on both windows and French doors in a kitchen extension for a consistent look – browse our guide for tips on how to choose window shutters. Kitchen blinds are practical and offer kitchen specific designs – find examples in our kitchen blind ideas. For privacy and an option that doesn't take up space on the windowsill, window films are worth a thought. We have plenty of wonderful window film ideas, too. Ceramic, porcelain or real stone are all possible for a kitchen. Take care requirements into consideration as well as costs. Explore your options in our guide to choosing floor tiles. Solid wood is not generally recommended for kitchens because of the moisture in the room. Instead, we'd recommend opting for engineered wood, which has the appearance of real wood, but is designed to be stable in the conditions. Find out how to choose the best engineered wood in our specialist guide. If you love the look of wood – or tiles – laminate is a budget-friendly option that convincingly mimics the look of real materials. It's always recommended to buy the best quality laminate you can for your budget, as the cheaper options can look a little shiny. You'll find plenty of inspiration, as well as more information on how to choose the best laminate flooring, in our guide. A budget friendly option, vinyl not only mimics natural materials, but is also renowned for its durability, scratch resistance and easiness to clean. Find out more in our guide to choosing vinyl flooring. You might also consider rubber if you're on the look out for flexible and contemporary flooring. Durable, hygienic and comfortable to walk on, it's becoming an increasingly popular option for kitchens. As you might have guessed, we've got all the information you need when choosing rubber flooring, too. Stylish, with a distinctly contemporary feel, resin and concrete flooring are fast becoming the flooring of choice for contemporary homes. Perfect for kitchen floors and well-prepped bathroom floors, concrete and resin are durable and resistance to spills, dirt and stains, making them a practical material, too. Find more tips on how to choose the best resin and concrete flooring in our specialist guide. While most competent DIYers will be able to tile or fit wood flooring themselves, sheet materials, such as rubber flooring or vinyl flooring, or poured flooring, such as concrete or resin flooring, should be installed by professionals. At the lower end of the kitchen cost scale, expect to pay upwards of £3,000 for good quality units for an average sized kitchen. On top of this, you'll need to add worktops, which cost upwards of £100, appliances and fitting, which can vary from a few hundred pounds to more than £2,000, depending on the kitchen's complexity. If your budget is tight, keep the kitchen's layout and design simple. Repainting your kitchen is an easy and inexpensive way to give it a new look without having to replace any major components – browse our kitchen paint ideas for inspiration.We have plenty of practical advice for how to paint kitchen cabinets, too, should you need it. When it comes to prioritising your budget, we'd recommend investing in high-quality worktops and taps. Other aspects can be found relatively affordably. High-fashion kitchens can look great, but may date quickly, so go for a classic look. Does your new kitchen need planning permission? If you’re planning to make internal structural changes to your kitchen, you won’t usually need planning permission, as this is covered by permitted development. The majority of single-storey extensions are also covered by permitted development; however, certain exclusions and criteria apply, so always check with your local authority’s planning department before starting work. Even if you don’t need planning permission, it may be worth applying to your local planning authority for a lawful development certificate, which proves that the work is lawful, and can be useful when you come to sell. If you are planning structural changes, make sure you use the services of an approved structural engineer – The Institute of Structural Engineers is a great place to source reputable people. Read more about planning permission and permitted development in our specialist guides. Who can fit a kitchen? Many kitchen companies offer an installation service, although you can fit a kitchen yourself (our guide offers step-by-step instructions) if you’re looking to cut the cost of your new kitchen. If you do choose this option, your extractor and cooker will need to be installed by an accredited electrician, and you may need a plumber to fit your sink and water-based appliances. Due to the cost of most worktops, it’s always best to ask a professional to fit these for you – mistakes can prove expensive. Alternatively, if you’re working with a kitchen designer, they may take charge of the entire project. If you're planning on carrying out any structural work, you might need to find a reliable builder, joiner, plumber, electrician and decorator. For each of the different trades, you should get at least three detailed written quotes – use our guide to find out how to compare quotes from tradespeople if you're looking for more information. That said, recommendations are always the best way to find people to work with, so ask friends and family before searching online. Bear in mind that the cheapest quote may not be the best if it does not meet all your requirements, and you need to feel comfortable with the people you choose to work with. If you plan to design a kitchen as part of an extension, you might find our house extension suppliers sourcebook a handy read; especially as we've covered the best kitchen sources. Once work on your kitchen starts, making changes can be costly. Agree on all of the final details and then stick to them. It’s especially important to confirm the location of appliances, kitchen lighting and sockets, making sure sockets are in places that will be convenient, such as by the fridge and kettle. You should also consider where to put charging points and whether you’d like USB sockets. And think carefully about extraction. Will you have a traditional overhead extractor, or could you install a downdraft model, which slots into your kitchen worktop and can pop up at the touch of a button? When it comes to artificial lighting, make sure you include a combination of task, ambient and accent lighting. By finalising the details and ordering materials now, you’ll help the project run smoothly. Now you have the team you want to work with and quotes agreed, it’s time for construction work to start. If you’re having walls demolished or an extension built, you may want to consider moving out while this work is completed. Alternatively, you could set up a makeshift kitchen – perhaps using your old cooker, sink and a couple of units – in a different room. If you decide to stay, be prepared for the disruption of a kitchen renovation (you may benefit from reading our top tips to living on site while renovation). If you decide to move out, make sure you visit the site regularly and are available to answer questions. While knocking down internal walls and stripping out an old kitchen should take a few weeks, building a kitchen extension is likely to take three months or more. During this time, walls, floors and ceilings will be constructed, cables inserted for electrics and pipes for water. Decorating is an important stage when you design a kitchen and is arguably one of the most fun parts. Once the walls plastered, you should be able to get a feel for how your new kitchen will look when it’s finished. We'd recommend painting the walls and ceiling before the units are installed to minimised the risk of drips and spills ruining your new kitchen. Although a plain white kitchen is timeless as it can easily be updated with accessories, consider going for a bolder wall colour, such as dark grey or petrol blue, for more of a style statement. If you're sure white is the shade for your kitchen, you'll love our white kitchen design ideas. Alternatively, you might try our grey kitchen design ideas (which promise the light and bright effects of white, without being white) or how about our dark and dramatic kitchen design ideas, for those of you who want an on-trend, atmospheric kitchen. If you're looking for practical tips on how to paint rooms and walls, you'l find them in our guide. We're got how to paint a ceiling covered, too. Consider a larder and utility to free up room and to move the noisy appliances out of the kitchen – we've got plenty of tips in our guide to planning and designing a utility room. Contrast the various elements – a bank of tall units, a run with no wall units – in different finishes. Just copy what is fashionable now – to avoid it dating quickly, try and have a broader understanding of where kitchen design is heading or stick to classic concepts.